Sonic Entropy's Panorama is out! Panorama by Sonic Entropy When Peter Almosdi, an engineering-physicist from Budapest, dreams of space, we are rewarded with Panorama. Almosdi tempers those dreams in the razored-edge crucible of his precise, high-end, devastating drum and bass, and we are granted a rare and sublime gift as listeners. These luxe beats have the polish and sophistication of the work of a lifetime, with the ease and effortless perfection of a master who is just getting started. Must hear! After a year long break, Uncoiled Loops is back! Our first release for 2015 is Theta, by Secant Prime available Jan. 16th. Amazon - Jan. 5th, and all other retailers on Jan 18th! War & Peace by Ambient Mechanics War is a terrible thing. It has touched and taken so many lives down through the ages...and continues to do so. This album was inspired by those who suffered and/or died during WWII, so the world we live in today could be a better place. In this fast world in which we live today, it's easy to forget to take a second to remember those who gave their lives so selflessly all those years ago. They were real people, just like us, who loved, hoped and dreamed...regardless of which side they were on or where in the world they lived. As you listen to the tracks on this release, please do just that...and don't forget those men, women, and children...they deserve not to be forgotten. Beatport - Dec. 1st, and all other retailers on Dec. 15th! From the concrete-clad west side of Rotterdam comes QNIEZERY. And from him comes 'spell my name in slowmo'. Don't bother asking questions about the name or the album title. Listen. 'spell my name in slowmo' is a mix of uncomforting beats with soothing, inspirational melodies. Early dubstep and late 90's electronics collide in what is simply defined as Bass Music. But behind that bass there's a multitude of sounds to discover, many of which originated as field recordings from late night and early morning city walks. There's guitars, viola da gamba's, bells, and all sorts of physical instruments integrated with otherwise sterile computer based - but amply shuffled - beats. Beatport - Nov. 3rd, and all other retailers on Nov. 17th! CAUTION! Do Not Listen while Driving. Its that Hypnotic. You'll arrive and not remember how you got here. Like smooth lava flow, Oelki's tracks are glowing and warm, the constant thump is like a heart beat of the earth. In the club, this will tickle your ears and the bass kick your chest while you move in the darkness until light. Hailing from Germany, Oelki has been producing Techno/Microhouse for only 3 years and has created these 6 most remarkable tracks for this collection. You need to hear this to believe it. All Retailers - Oct. 5th! This compilation features all relatively new artists, each with their own take on what a horror soundtrack for the sPoOkY month of October! You may recognize 2 artists from previous Uncoiled Loops compilations and releases, Ambient Mechanics and Secant Prime, of which the former (AM), with the help of IDMforums.com, was instrumental in organizing this compilation. On this album, you find some artists such as Kneedless, are "found sounds" artists using things like ping-pong balls in mixing bowls, some are neo-classical artists such as Daniel & Mikael Tjernberg, and some, such as Forbidden Star, came from punk roots or various other genres, now trying the other end of musical expression. Beatport - July 28th, and all other retailers on Aug 11th! Obey Your Signal Only 2: A Dubstep / Bass Music Compilation by V/A This second installment of "Obey Your Signal Only" brings the whole series up a notch. With Glitch Factor's campy but amazing "We All Fall Down" to QNIEZERY's driving and thoughtful "Charlie Says..." to Photophob's dark and brilliant "Find Him, Kill Him", you won't find another compilation with as much diversity and cohesiveness. The compilation also includes the full track list in a continuous DJ mix available as one download. Beatport - April 7th, and all other retailers on April 14th! Remixes from the last 6 years, varying from DnB to synthpop to house to illbient. The best work yet from hEADaCHE of CEOXiME. Beatport - January 8th, Amazon - January 15th, iTunes - January 22nd, and all other retailers on January 29th! This is the first collaboration of Uncoiled Loops and Facility Records to bring you some of the best dark ambient / experimental music in the genre, with some well known acts as well as new, up-and-coming acts. This includes Dead Voices On Air's "Power Failure" as one of the 7 previously unreleased tracks, includes Herwig Holzmann's (of Photophob fame) now out of print "Watching the Abortive Mimoid". Roth Mobot is leading circuit bending in Chicago, with 30+ performances, museum/gallery installations, workshops, and so much more. It also provides for the first time Controlled Bleeding's "The Poisoner" (Part 2, excerpt) as a single track download. Chvad SB (of things outside the skin) is currently touring with Controlled Bleeding, and has just completed a soundtrack for the horror flick "Gut." Ambient compilation out soon! Very exciting lineup, soon to be announced! Sign up on facebook for up to the minute updates. Do Not Follow: A Minimal Techno / Microhouse Compilation by V/A A cracking mix of minimal tecnho and microhouse with elements ranging from synthpop to hard techno and IDM. Download the mix for free! CD and additional download options will be available soon. We are now accepting submissions for artists for a techno/microhouse compilation! The generes can range from minimal techno, techno, microhouse, and synthpop - but on the darker side. Looking for tracks like Plastikman, Jimpster, Luke Slater, Swazak, BCD, Pole, Audion, etc. The plan is to put out a CD as well as have digital distribution, with a mixed version of all the tracks available digitally for free or the price of 1 track. According to Wikipedia, Dubstep came forth from UK Garage in the early 2000s, containing overwhelming bass lines and funky drum patterns. Darkhop, on the other hand, is a much lesser referenced style, and is only mentioned in the Scorn entry. In many minds, these are one and the same genre. As an attempt to bring artists subscribing to these two similar genres together, Uncoiled Loops has compiled an 11 track compilation, bringing artists influenced by Kode9, Scorn, Burial, Godflesh, and Boxcutter to one CD. To hear what these artists brought forth, a FREE DJ mix of all 11 artists is available for free from the CD baby site. The CD contains the 11 individual tracks as well as bonus Multimedia material, including this 48 minute DJ mix. Obey Your Signal Only: A dubstep / darkhop compilation out later this month! hEADaCHE remixes V2: Highly Dangerous Defects is out now! Looks like hEADaCHE remixes V2 will be delayed a few weeks. One for Darksonus members and one which is dubstep influenced. Feel free to submit! DarkSonus V2: Discritize now available on CD baby and this site. See the catalog. Well, CEOXiME is no longer. More info at the CEOXiME site. hEADaCHE has completed remixes for TV, InfinityInterrupt, and function13. Multiple CD purchases will receive discounts and sometimes if you catch me inthe wheeling and dealing mood, I'll even take offers.Email me with your order, and I'll give you the price. Pretty simple. Tax Sale! 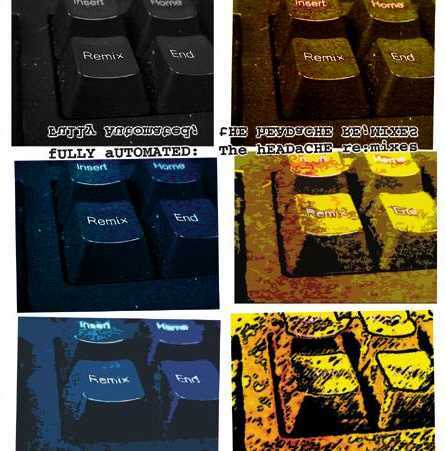 Spend your refund on "Fully Automated - The hEADaCHE re:mixes", Now $10, including "Found Sounds Sample CD Vol. 1: Automotive Factory Sounds". Get it today! New reviews and new interviews. Each distributor has different deals - check them all out! Release date set for 12/15/04, just in time for Christmas! Distribution through Musicwerks, DSBP, and many more. Purchases through this website recieve a free copy of UNCOILED LOOPS PRESENTS: Found Sounds Sample CD Vol. 1: Automotive Factory Sounds for a limited time. As you can see, most are previously unreleased! Order your copy today! Soon, samples will be up on the catalog page. After long delays, the hEADaCHE of CEOXiME re:mix CD : Fully Automated will be released. Track listing, artwork and samples will be up soon! uncoiled loops releases UNCOILED LOOPS PRESENTS: Found Sounds Sample CD Vol. 1: Automotive Factory Sounds. This is a 43 minute recording (indexed by the minute) walks from trimming the final car, through the body shop welding, back through chassis, out through final testing. It calms babies while giving us adults a little more to listen to than the standard white noise CDs and/or a sample CDr for musicians.